[UPDATE] This morning, Michael Nitzky of NY1 announced the postponement of the debate due to the untimely passing of Congresswoman Nydia Velazquez’s mother. We send our deepest condolences to the Velazquez family. We hope that the postponement provides the time for the management of NY1 to reconsider its position and include Mr. Martinez as a candidate in all future debates, because he was put on the ballot by the people of the 7th District. Out of respect for the Velazquez family Bum Rush The Vote & their supporters in the Occupy Wall Street movement have canceled their action scheduled for 4:30pm today at NY1’s Chelsea Market Studio and encourage all supporters to join them at 7pm tonight for a rally with speakers and performances at the Yippie Museum Cafe, 9 Bleecker St, New York, NY 10012. Yesterday, the Bum Rush the Vote campaign came up against another roadblock in their grassroots experiment of participatory democracy as NY1’s Inside City Hall barred Hon. George Martinez from participation in a debate of the 7th Congressional District. “Our longstanding policy at NY1 when we’ve held debates is to give seats to candidates who we consider to be viable…who are on the ballot…[and] getting donations from voters in the district and spending the money on basic campaign expenses,” said Bob Hardt, Political Director at NY1, which is owned by Time Warner Cable company. While Mr. Martinez has indeed been approved by the Board of Elections, and submitted all required Federal Elections Committee (FEC) paperwork, he was not required until recently to submit an FEC financial disclosure form because his campaign had succeeded in getting nearly 3,000 signatures and his place on the ballot without spending the minimum disclosure amount of $5,000. To us, this represents a victory for people-powered, grassroots politics, not a lack of “viability”! Over the course of the day yesterday, hundreds of people spoke out in support of Mr. Martinez and against the censorship that NY1 would impose by barring a candidate from a debate because of the amount of money his campaign has/hasn’t raised. The group had planned a rally and press conference at NY1’s Chelsea Market studio this afternoon, with allies from OWS. This morning, Michael Nitzky of NY1 announced the postponement of the debate due to the untimely passing of Congresswoman Nydia Velazquez’s mother. We send our deepest condolences to the Velazquez family. We hope that the postponement provides the time for the management of NY1 to reconsider its position and include Mr. Martinez as a candidate in all future debates, because he was put on the ballot by the people of the 7th District. Out of respect for the Velazquez family Bum Rush The Vote & their supporters in the Occupy Wall Street movement have cancelled their action scheduled for 4:30pm today at NY1’s Chelsea Market Studio and encourage all supporters to join them at 7pm tonight for a rally with speakers and performances at the Yippie Museum Cafe, 9 Bleecker St, New York, NY 10012. The following is our previous advisory announcing yesterday’s action. [NEW YORK, NY] A scheduled debate on NY1’s Inside City Hall tonight between 3 of the candidates from the 7th Congressional district has intentionally excluded the race’s 4th candidate, long-time community activist and occupier candidate George Martinez. In response to this blatant attack on the free speech rights of a congressional candidate, Bum Rush The Vote will hold a protest action and press conference outside of NY1’s Chelsea Market studio (75 Ninth Avenue) at 4:30pm today, June 11. Yet, current FEC records – which can be viewed here: http://query.nictusa.com/cgi-bin/can_detail/H0NY12159/ – show that Mr. Martinez has indeed filed with the FEC, although he was not required, until recently, to file a financial disclosure form because his campaign earnings/spending did not exceed $5,000. This decision to not raise significant outside funding for his campaign was a central tenet of Bum Rush The Vote, which aims to create a new template for participation in politics without large sums of money. “Nearly 3,000 people from the community have signed petitions to have Mr. Martinez on the ballot, and we haven’t raised enough money to be considered for this debate?” said Jelani ‘Smash’ Mashariki of Occupy The Hood. Bum Rush the Vote is demanding that Mr. Martinez be allowed to participate with his fellow candidates in tonight’s debate. They will gather with Mr. Martinez outside of the studio at 4:30p.m., along with members of Occupy Wall Street, Occupy The Hood, and allied groups to demand equal treatment for all balloted candidates. The Bum Rush premise is simple: Controlling politics without money is power, people power. Our goal is to create an open-source, crowd-sourced DIY campaign. All of the resources we need to accomplish this goal are available to us due to the fantastic technology that we now have access to. We started this campaign with no money, and are using our resources in a very efficient and frugal manner. Tagged 7th district, congress, debate, george martinez, Michael Nitzsky, New York, NY1, nyc. [NEW YORK, NY] George Martinez, a Brooklyn native, hip-hop artist and seasoned Occupy Wall Street activist has announced his candidacy for Brooklyn’s 7th Congressional District. In a clear statement honoring Occupy Wall Street’s non-partisan process, an autonomous parallel movement calling itself “Bum Rush The Vote” has announced it’s intentions to grab political seats using the same grassroots guerrilla campaigning strategies that quickly catapulted the Occupy message from New York’s financial district onto the international stage. George Martinez is the first of several Occupier candidates pursuing public office under the “Bum Rush The Vote” campaign banner. In the June 26 Democratic primary he will be challenging Nydia Velazquez whose tenure as a New York representative has spanned two decades. Tagged 7th district, bum rush the vote, congress, george martinez, occupy the hood, occupy wall street, ows. Tim DeChristopher was thrown into the isolation of the Secure Housing Unit or SHU reportedly because one angry Congressman complained about a letter DeChristopher sent while in low security custody in the Federal Bureau of Prisons.You can read the letter here…While our followers likely know about imprisoned environmental activist Tim DeChristopher, many do not know that he recently spent 3 weeks in isolation because an anonymous member of congress wrote a letter to the FBOP complaining about his correspondence. For additional background on what transpired over those three weeks we encourage you to read Jeff Goodell’s comprehensive account for Rolling Stone. Last night we were contacted by the producers of RT America’s The Alyona Show who ran a segment on Tim’s isolation. They told us about their efforts to determine the identity of the congressperson responsible for Tim’s transfer to an isolated unit, read below to find out how you can help them, we encourage everyone reading this to get involved with their effort. 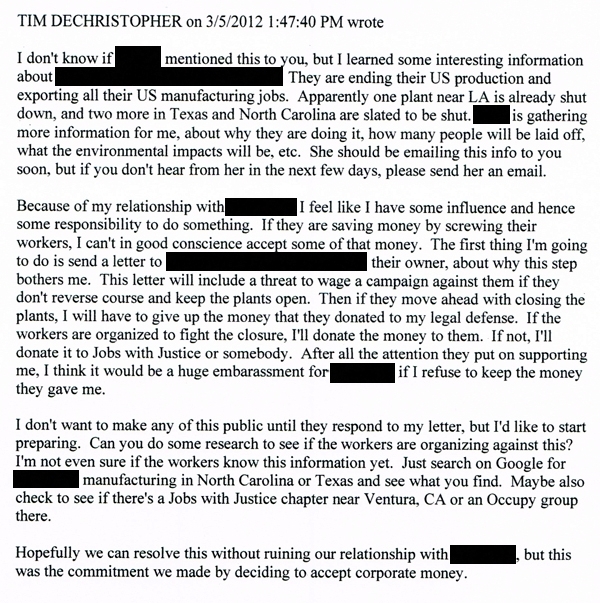 DeChristopher merely “threatened” to return a corporate donor’s money and wage a campaign against her/him because he found out the donor was outsourcing jobs. He did not pose a threat to anyone. Yet for exercising free speech, he was “thrown in the hole”. Human rights groups have compared the experience of being in the SHU to torture. After a visit, DeChristopher’s lawyer said that the normally upbeat man looked visibly disturbed after just three weeks. The FBOP throwing prisoners in isolation without due process isn’t an irregular occurrence to be sure, but in this case, it’s particularly disturbing that it came as a result of political pressure. Although DeChristopher is out of isolation now, we’re still keen on finding out which Congressperson thought it was a good idea to put him there in the first place. So we’re asking you, the reader, to help us. …By asking, of course. Its true that reaching out to 435 Congresspeople is a task of biblical proportions. So it would be particularly helpful if voters with representatives on the House judiciary subcommittee on crime, terrorism and homeland security reached out. The panel is responsible for overseeing the Bureau of Prisons, after all. So feel free to ask them to investigate the matter, if they are not responsible. 1.Get in touch with your Congressperson by calling his/her office. [Don’t know how to contact your congress person? Simply click HERE & type in your zip code] Identify yourself as a constituent (and please, actually be one!) then inform the staffer that you are calling in response to a television program. Say that you are inquiring whether or not the Congressman contacted the Bureau of Prisons about taking punitive action, including recommending isolation, in response to a letter he sent on March 5. 2. You may not receive a response right away. Congressional staffers are quite busy. Be persistent. Explain to who you speak to that if you don’t receive a definitive “no” response, the lack of an answer could be construed as a passive admission. Most importantly, stress that you don’t want to hold the Congressman unfairly responsible for this. Eventually, you’ll speak to a staffer. 3. Once you finally speak to a staffer who works on the subcommittee issues, inquire who it is you’re talking to. Note who you are speaking to and the time of the conversation. Then ask them directly on the record: did your boss contact BOP about DeChristopher’s letter? Did he/she request that punitive measures be taken against Tim DeChristopher, including isolation? 4. If you don’t receive a definitive answer, ask the staffer to verify for you. 5. If the staffer actually says yes…don’t judge. Politely ask for an explanation. 1. Does the Congressperson plan on raising the issue of isolation without due process in a subcommittee hearing? 3. What is Rep. X’s position on the detention of Tim DeChristopher? Once you receive answers about DeChristopher’s story and the subcommittee member’s position on putting prisoners in isolation without due process…reach out to us! [RT America in Washington, DC by emailing TASProducer@Gmail.com ] We will keep our viewers updated on the situation as responses roll in. Tagged BLM, congress, FBOP, SHU, solitary confinement, tim dechristopher.